July’s Third Thursday happened to be on the hottest day of the year. Despite this, a brave group of YPN Muscatine members met at the Muscatine Municipal Golf Course to Network and hit some golf balls on the range. 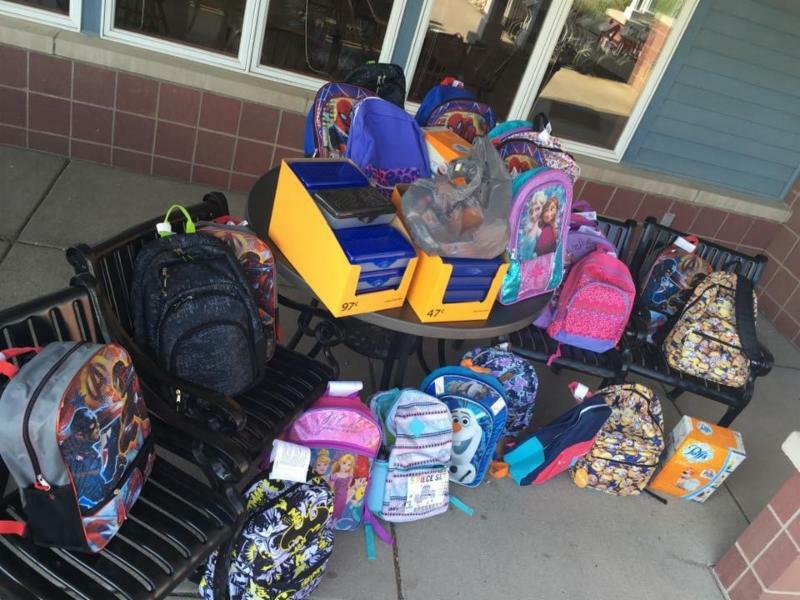 We also collected school supplies to donate to Franklin Elementary School. Thanks to all of the YP’s who donated! YPN was fortunate to have Michel Pontarelli, former career coach and councilor for the University of Iowa’s part time MBA program, run us through the negotiation experience. 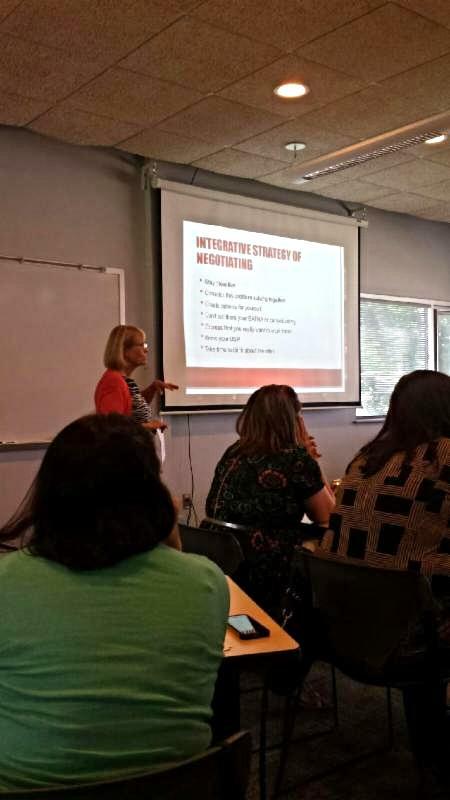 Our summer Lunch & Learn about salary negotiation was full of great tips and situational practice for getting what you are worth. Remember that an offer from a company is much more than salary. 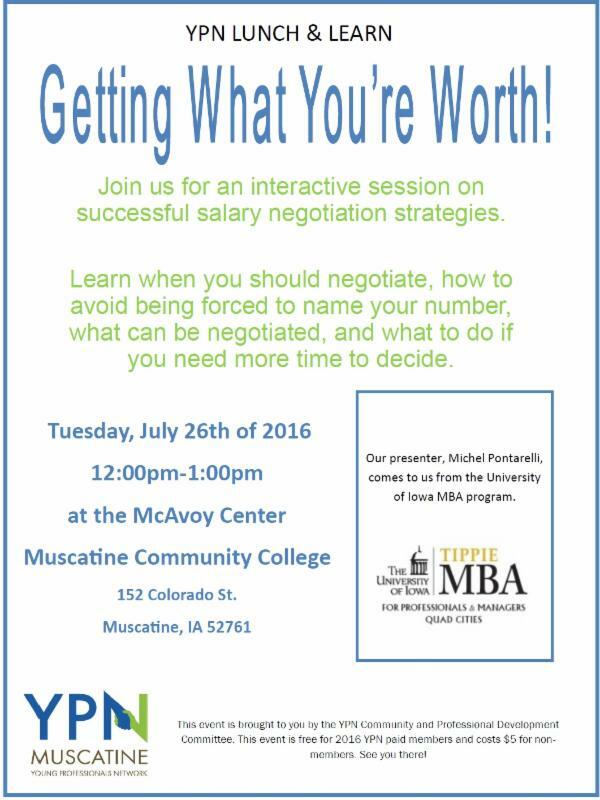 Vacation time, healthcare benefits, retirement benefits, and much more are all negotiable! We also were able to munch on some awesome tacos from Mami’s, which may need to be included in our next negotiations! Position: Assistant Manager of the Wine and Spirits Department. What do you like to do for fun? I like to spend time with Monica and the boys, I also enjoy golfing and long walks on the beach. Why did you join YPN? I joined YPN to network and also to get involved in the community. What is your favorite YPN event? I have only been to two events so far but I really enjoyed the event at Contrary, and the beer was a plus. RAGBRAI happenings? Why not volunteer? to add to our team. If you are passionate about youth and improving the lives of others then this might be just what you are looking for! a BA in social work or related field. This is a 20 hour a week position, flexible work schedule that does require some evenings and periodic weekends. Send cover letter and resume to Lindsey Phillips at Big Brothers Big Sisters, 1823 Logan Street, Muscatine, IA 52761 or gro.YenitacsuMnull@spillihpl. Wondering about the new chips on your credit cards. Planet Money is a fun podcast that explains the madness. Why is small talk so excruciating? Have you been on our website lately? Did you feel like a stranger? Did you even know we had a website? Our website has changed! 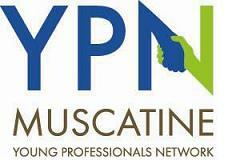 We hope that you can get more out of our new website, still at ypnmuscatine.org. 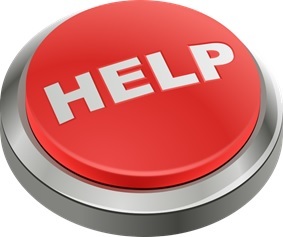 Soon the weekly updates and much more will be available on our updated site, but we would like your help first. Is there something you would like to see on our website? Let us know by emailing moc.semoHlhuRnull@reinuMhteS! Position (provide a description if you’d like): Associate Transportation Analyst. I work with a network of freight forwarders to arrange export shipments for the companies under the Kent umbrella. 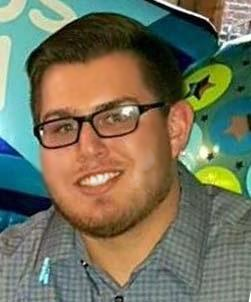 Previous employer/positions or general overview of experience: I took my position with the Kent Corporation after graduating from Grandview University last May. During my time at Grandview I worked as a Sales Trainee for the Fastenal Company. What do you like to do for fun? I love spending time on the water in the summertime, and in the fall I am all about Iowa Football. Anything else? Go Hawks !!! 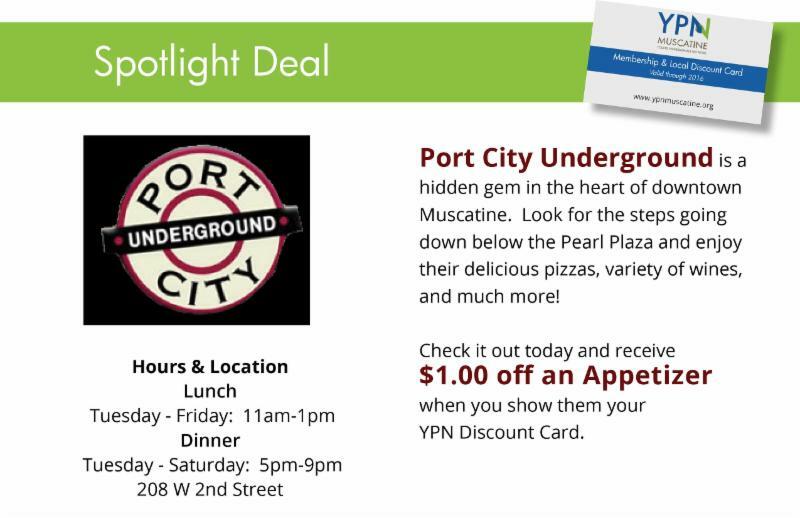 RSVP for TODAY’s YPN Lunch and Learn! A delicious taco bar will be catered from Mami’s Authentic! News about our members to our members. We are 100 volunteers SHORT for Saturday, July 30. No heavy lifting required – we just need friendly people to help welcome our 15,000 visitors and help them find their way. RAGBRAI participants have started arriving to park their vehicles for the week at MHS (when it is full, which it’s expected to be, then we’ll use Mulberry school parking, if full, then MCSD). Numerous cars will arrive in the early morning hours on Saturday for approximately 1,000 +/- cars to be parked for the week. 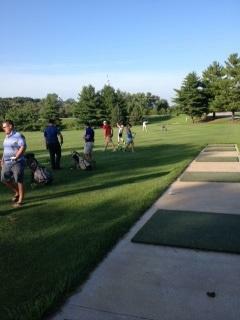 We are told to expect 800+/- campers for Friday night (we’ll have a few tonight) behind Hayes school. 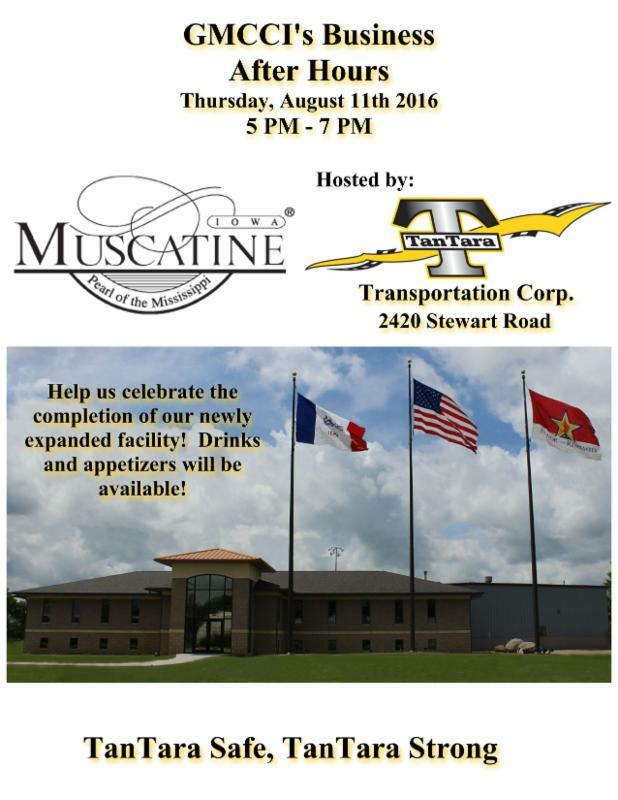 We will be running Muscabus shuttles to the downtown-area and Park Ave. restaurants from 5:00 p.m. to 8:00 p.m. Multiple charter and team buses will arrive and depart MHS starting Friday, July 22 and should be done by late afternoon Saturday, July 23. The huge undertaking of coordinating pre-purchased parking reservations and providing food options, camping areas with showers is being championed by the Muskie Booster Club – a fundraiser for the Club. It sounds like they could use some extra hands tomorrow as well. There are 100 or so cyclists sleeping at the Y tomorrow night, 7/22 – a fundraiser for the Y. Some residents will be hosting cyclists at their homes on Friday, 7/22 and on Saturday, 7/30. Expect Cedar Street between the by-pass and MHS/Hayes School to be extremely busy the 22nd and 23rd. The majority of cyclists and buses will be gone by 4:00 on the 23rd. If you have a high schooler that needs to pick up their school laptop, encourage them to get that done TODAY. The riverfront parking spaces and boat ramps will be closed starting at 3:00 p.m. on Friday through 6:00 p.m. on Saturday. The cyclists will be coming in on Hershey Ave. to Mississippi Dr. to Iowa Ave, turning right into the riverfront, then exiting on Cedar St. Hershey Ave./Mississippi Dr. will be closed to vehicular traffic from the Hwy 61 by-pass to Mulberry Ave. from 6:00 a.m. to 6:00 p.m. The detour around downtown will be 8th Street. The open crossover streets, with MPD traffic control, will be Main Street and Houser – expect delays. If at all possible, avoid it all by using the by-pass. In addition, there is a huge soccer event occurring Thursday, Friday, Saturday and Sunday of next week. Avoiding Houser at Hershey Ave. on the 30th is advisable. The soccer traffic will not be able to exit the by-pass at Hershey until after 6:00 p.m. They will be routed to Mittman Road to get to the soccer complex. Our downtown area, including the riverfront will be crowded with cyclists, pedestrians, cars and trucks, buses and semis. 2nd Street will be open, however the feeder streets to Mississippi drive will be barricaded at the alley. Most municipal parking lots downtown will be utilized for RAGBRAI and the Farmers’ Market. The parking lots and spaces we do not block off, will be filled with visitors picking up their cyclist(s) starting early on Saturday morning. Cedar St. will be the main route for cyclists to get to their cars at MHS. An enormous amount of cyclists will also make their way to Muscatine Community College and the Muscatine Mall. We are encouraging them to take the trail from the riverfront through Weed Park to MCC and the Mall. Please be aware of cyclists crossing Hwy 22 to get to Weed Park. 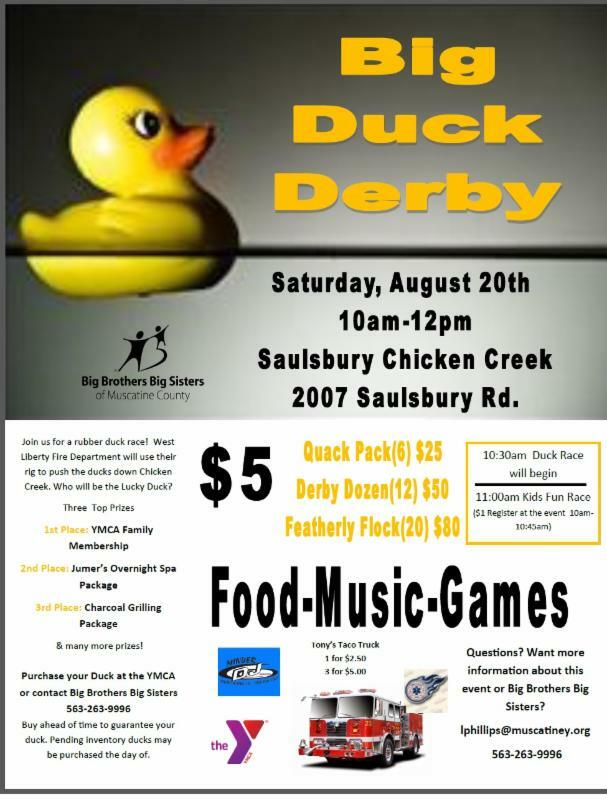 Great River Days events will be taking place on Friday and Saturday as well. People will be searching for parking spots as close to the riverfront as they can get. 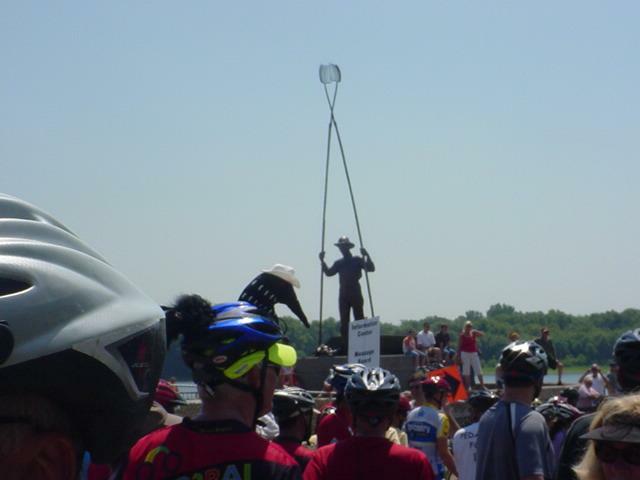 The RAGBRAI route to the riverfront will have some unique decorations on the 30th. The park on Hershey at Houser will have the American Legion train engine/truck float and veterans handing out flags and/or bottled water. MP&W is hanging their beautiful 20′ x 30′ American flag over Hershey Avenue by the soccer fields. Carver Corner will have a 20′ letter “M” made out of bicycle tires by folks at Monsanto. The River Monster will make an appearance somewhere along the route too. Whether you live along the route or Cedar St., please feel free to decorate your yards with bicycle art or flowers or whatever you desire to enhance the festive environment and show off our pride in our community. There is a bike art contest with a cash prize – see http://www.ragbraimuscatine.com/#!residents/cee5. 1. We could use as many volunteers as we can get. We will have 5 Information centers/satellite centers staffed with friendly people welcoming the support crews, cars, trucks, buses and semi’s at major intersections coming into town to help them find their way. 2. 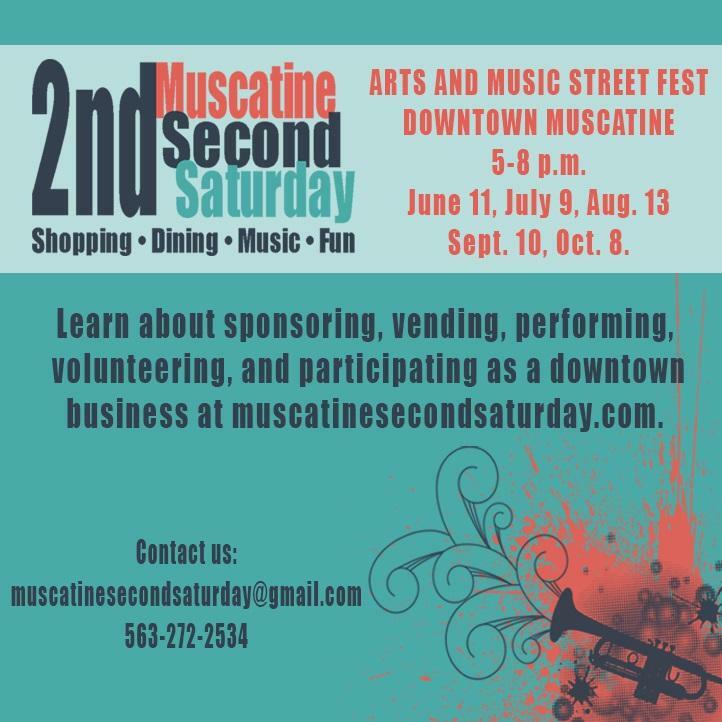 We will also need volunteers acting as tour guides on Musca buses/shuttles Saturday, 7/30. 3. In addition to that, we would like as many friendly people stationed downtown and on the riverfront to answer general questions like “where is the High School located”, “where is the Community College located”, “where should I eat”, “where’s the nearest grocery store”, etc. 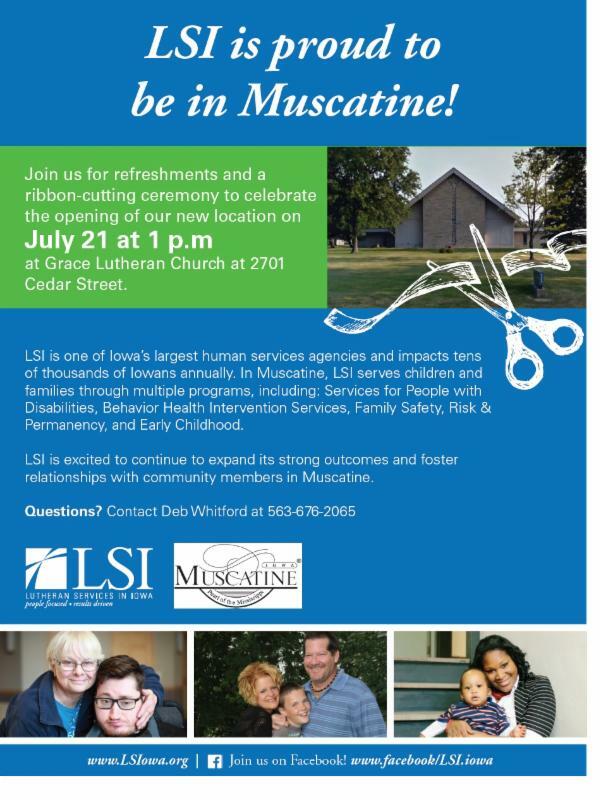 You can sign up for shifts in 1-hour increments at www.volunteermuscatine.org. We are excited to welcome these national and international visitors to our beautiful community. Once they see what a gem Muscatine is, they will make plans to come back and visit us again – for a longer stay next time. If you can get a glimpse of them, some of the team buses coming in are converted school buses decorated to reflect the team’s name or theme. Some are quite creative. 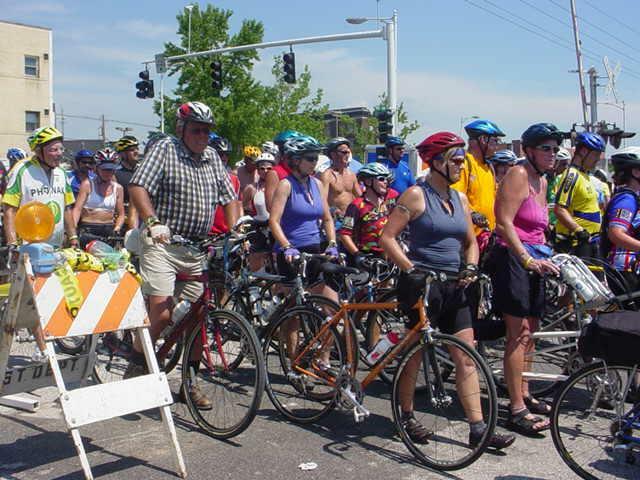 Please know we will have an enormous amount of people – cyclists, pedestrians, cars, trucks, buses and semis in our city for the first time and trying to find their way to MHS, MCC, the riverfront, etc. Please watch out for them, have patience with them and help if you can. Also, let our Police, Parks & Rec, Solid Waste and Public Works Departments know that we appreciate all they do — they have been and will be working many extra hours with 3 major events going on in our community next weekend. 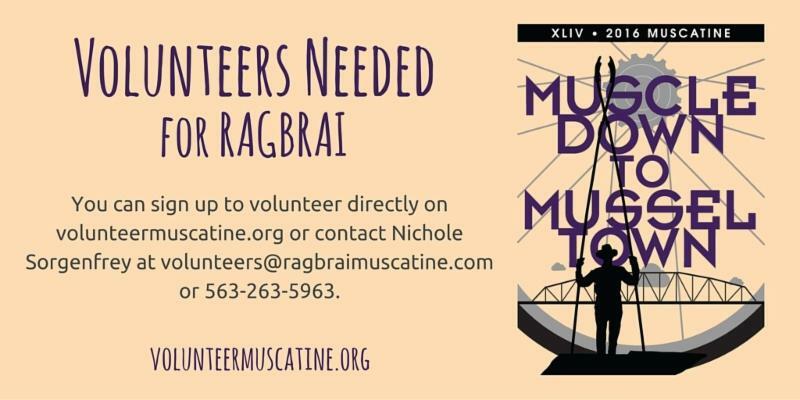 More information can be found at www.RAGBRAImuscatine.com and on our Facebook page: RAGBRAI Muscatine.